We all know the problem of oily T-zone. Even if your skin is not greasy in other areas, the forehead, nose and chin are for most of us a cause of worry. Mattifying creams, bases and foundations are not enough. 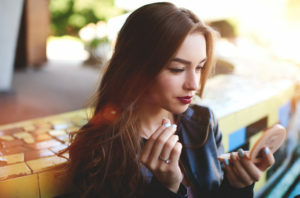 You need powder, which will make your face matte on demand when after several hours at school, work or running errands in the city, it begins to be shiny. Powder will never become dated. Our grandmothers and mothers loved it and we still use it nowadays. It’s effective, cause no other product will even give us such an intensive mattifying effect. However, it is important that the powder you’re using on everyday basis is not too heavy, so that it doesn’t create a mask on your face. 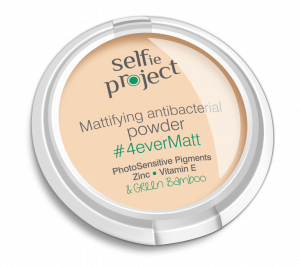 The delicate mattifying antibacterial powder by Selfie Project will provide you with matte and natural skin. It is an organic product, containing only natural ingredients, that are harmless or even favorable to skin. Zink is a magic component with antibacterial and healing effect, vitamin E fights free radicals, while green bamboo extract reduces sebum production. It’s a perfect combination, which combined with photosensitive pigments, provides an optical effect of smooth skin. The neutral shade of the powder is perfect for naturally fair complexion and will not make your face look too dark or too light. The product will not be visible even in photos taken with flash. Simply apply a thin layer of it, using a large synthetic brush, to areas you want to mattify or where you want to refresh make-up. It can be used separately, in order to prevent your face from shining. It’s worthwhile having it in your purse to be able to refresh your skin at any time!